India is the largest producer of the livestock in the global market with a livestock base of 304.8 million including 199.1 million cattle, 105.3 million buffalo, 71.6 million sheep and 140.5 million goat. The livestock population is projected to increase to 322 million by the year 2015. In goat population, India ranks second in the world with a goat population share of 25% in India's Livestock population. India Poultry Industry is also emerging as the world's 2nd largest market with a production of 63 billion eggs and 649 million poultry meat. The marine and fish industry in India is growing at a compound annual growth rate (CAGR) of about 7% India's and is expected to reach Rs. 67,800 crore by 2015 from the current level of nearly INR 53,000 crore. Overall, the Indian livestock is growing at a fast pace and emerging as a significant contributor to the global market. Animal husbandry plays a vital role in Gujarat's rural economy, while contributing nearly 5% to the state GSDP. As per livestock census 2007, total livestock population of Gujarat was 237.94 lakh. Gujarat has 23 Intensive Cattle Development Projects (ICDP) with 1,078 Breeding Centres in the state which are aimed at improving the breed of cattle and buffaloes. Gujarat also has 12 Intensive Poultry Development Projects (IPDP), 5 District poultry Extension Centres, and 85 Poultry Service Centres. 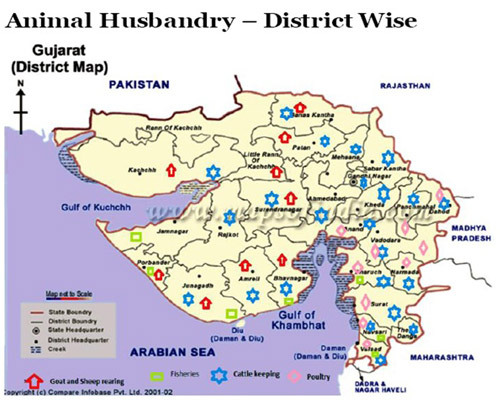 The state of Gujarat has the longest coastline of 1600 km and ranks first among the states in marine fish production with an export of 1.98 lakh tonnes of marine products worth Rs. 2,156 crore. GLPC is involved in promotion of livelihood in the Animal Husbandry and Dairy sector by facilitating technical and financial assistance to the beneficiaries through various Central and State sponsored schemes. During the year 2011-12, GLPC facilitated providing livelihoods in various sub sectors covering Fodder Farming, Gauchar Land Redevelopment, Poultry, Fisheries and Goatery for around 5,000 households across the state. GLPC joined hands with Central Salt Marine & Chemical Research Institute to encourage seaweed cultivation along the state coast. The project named 'Project SagarLaxmi' has been initiated to provide livelihood opportunities to potential beneficiaries of coastal belt. Under this project, CSMCRI have introduced the seaweed 'Kappahycus Alvarezii' in India which finds application in several industries such as pet food, breweries, fertilizer, etc. The project was initiated in Jaffrabad block covering around 500 SHG members and is expected to expand to cover more than 10,000 families and to generate income of INR 6,000 to 12,000 per month. The produce will suffice the requirement of many of the manufacturing industries which are currently procuring the same from other countries.